is professor of comparative archaeology at University College London. He is the author of The Origins of Monsters (2013) and What Makes Civilization? (2nd ed, 2018). Civilisation is back. But it is no longer the preserve of ‘Renaissance man’ or of ‘the West’, or even of literate societies. Civilisation is a way of talking about human history on the largest scale. From the cave paintings of Lascaux to the latest MoMA exhibition, it binds human history together. But in at least one essential aspect, the concept of civilisation remains fundamentally exclusionary. It is still the stuff of galleries, museums and UNESCO World Heritage sites; of prized images, objects and structures, rather than of living humanity. The prehistoric stone structures of Göbekli Tepe – where a heritage park has now opened, near the border between Turkey and Syria – are being mooted as everything from the Garden of Eden to the cradle of civilisation and the world’s first temple. We still want a civilisation raised up high above the everyday realities of its human makers and keepers. In troubled regions, such as the Syrian-Turkish border, monuments like these quickly become altars of sacrifice for real human lives. Importantly, there have always been other ways of understanding ‘civilisation’. The 20th-century French anthropologist Marcel Mauss thought that civilisation should not be reduced to a list of technical or aesthetic achievements. Nor should it represent a particular stage of cultural development (‘civilisation’ versus ‘barbarism’, and so on). Civilisation could be found in material things, but above all it referred to a potential in human societies. In Mauss’s view, civilisation is what happens when discrete societies share morally and materially across boundaries, forming durable relationships that transcend differences. It might seem an abstract debate, but it’s not. Let me try to explain. Roughly four years have now passed since the military ascendance of Daesh or ISIS in the Middle East. ISIS routinely destroyed or sold antiquities, culminating in their 2015 assault on the ancient caravan city of Palmyra, in Syria, a World Heritage Site. Under ISIS occupation, Palmyra’s Roman theatre had become a stage for gruesome atrocities, including the public beheading of Khaled al-Asaad, a native of modern Palmyra, and until then its director of antiquities. 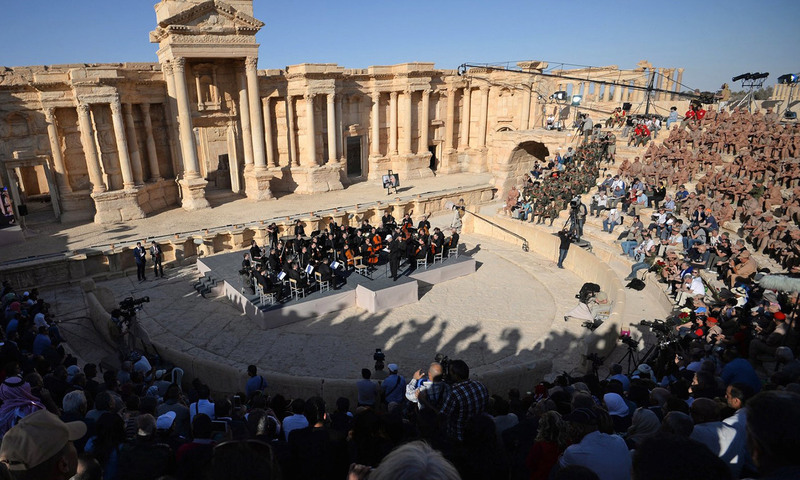 In the spring of 2016, after a Russian-backed (and, as it turned out, temporary) liberation, Palmyra was hosting the Mariinsky Symphony Orchestra. At their performance, an audience of Russian soldiers sat to hear Bach, Prokofiev and Shchedrin. The event was designed to present a particular, and I think misguided, idea of civilisation. It was, in the words of Russia’s president Vladimir Putin via live link from Moscow, ‘part of humanity’s heritage’. Through the ages, Palmyra had opened its gates to all manner of foreign gods. ‘Everything,’ wrote the Russian ancient historian Michael Rostovtzeff in 1932, ‘is peculiar in the peculiar city of Palmyra.’ Yet nothing, perhaps, so peculiar as these events of 2015-16. What was ‘civilised’ about playing Prokofiev in the beautiful wreckage of one ancient Syrian city, while the living population of another, Aleppo, to the north, was simultaneously under attack? The ancient temples of Palmyra were not designed as works of art, to be passively viewed or admired, any more than the caves of Lascaux or Font-de-Gaume were intended as art galleries, or Göbekli Tepe as a prehistoric version of the Sistine Chapel. In antiquity, their cult statues demanded live offerings and sacrifices, and now it seemed that they were demanding them again. Sacrifice of this kind seems somehow bound up with our modern understandings of ‘heritage’, ‘art’ and ‘civilisation’, in ways that are rarely thought about or articulated. Surely what this tells us is that these are, to all intents and purposes, our own modern gods – the gods of the global north. When people use the term ‘early civilisation’, they are mostly referring to Pharaonic Egypt, Inca Peru, Aztec Mexico, Han China, Imperial Rome, Ancient Greece or other ancient societies of a certain scale and monumentality. All of these were deeply stratified societies, held together mostly by authoritarian government, violence and the radical subordination of women. Sacrifice is the shadow lurking behind this concept of civilisation; the sacrifice of freedoms, of life itself, for the sake of something always out of reach – an idea of world order, the mandate of heaven, blessings from those insatiable gods. There is something wrong here. The word ‘civilisation’ stems from a very different source and ideal. In ancient times, civilis meant those qualities of political wisdom and mutual aid that permit societies to organise themselves through voluntary coalition. The modern Middle East provides many inspiring examples. In the summer of 2014, a coalition of Kurdish units broke the siege of Mount Sinjar in Iraq to provide safe passage, food and shelter for thousands of displaced Yazidis. Even as I write, the population of Mosul is raising to life a new city from the war-torn rubble of the old, street by street, with minimal government support. Mutual aid, social cooperation, civic activism, hospitality or simply caring for others: these are the kind of things that actually go to make civilisations. In which case, the true history of civilisation is only just starting to be written. It might begin with what archaeologists call ‘culture areas’ or ‘interaction spheres’, vast zones of cultural exchange and innovation that deserve a more prominent place in our account of civilisation. In the Middle East, they have deep roots that become visible towards the end of the last Ice Age, around 10,000 BCE. Thousands of years before the rise of cities (around 4000 BCE), village communities already shared basic notions of social order across the region known as the ‘fertile crescent’. Physical evidence left behind by common forms of domestic life, ritual and hospitality shows us this deep history of civilisation. It’s in some ways much more inspiring than monuments. The most important findings of modern archaeology might in fact be these vibrant and far-flung networks, where others expected to find only backward and isolated ‘tribes’. These small prehistoric communities formed civilisations in the true sense of extended moral communities. Without permanent kings, bureaucrats or standing armies, they fostered the growth of mathematical and calendrical knowledge; advanced metallurgy, the cultivation of olives, vines and date palms, the invention of leavened bread and wheat beer. They developed the major textile technologies applied to fabrics and basketry, the potter’s wheel, stone industries and bead-work, the sail and maritime navigation. Through ties of kinship and commerce, they distributed these invaluable and cherished qualities of true civilisation. With ever-increasing accuracy, archaeological evidence allows us to follow the founding threads of this emerging fabric of civilisation, as it crosses the plains of lowland Iraq, weaves back and forth between the shores of the Mediterranean and the Black Sea, through the foothills of the Taurus and Zagros mountains, and down to the marshy head of the Persian Gulf. Civilisation, in this new sense, forms a cultural tapestry of startling complexity and grandeur, centre-less and open-ended, woven from a million tiny social bonds. A moment’s reflection shows that women, their work, their concerns and innovations are at the core of this more accurate understanding of civilisation. Tracing the place of women in societies without writing often means using clues left, quite literally, in the fabric of material culture, such as painted ceramics that mimic both textile designs and female bodies in their forms and elaborate decorative structures. To take just one example, it’s hard to believe that the kind of complex mathematical knowledge displayed in early cuneiform documents, or in the layout of urban temples, sprang fully formed from the mind of a male scribe, like Athena from the head of Zeus. Far more likely, these represent knowledge accumulated in preliterate times, through concrete practices such as the applied calculus and solid geometry of weaving and beadwork. What until now has passed for ‘civilisation’ might in fact be nothing more than a gendered appropriation – by men, etching their claims in stone – of some earlier system of knowledge that had women at its centre. From such a starting point, we can see the true history of living civilisation. It reaches back far beyond the earliest monarchies or empires, resisting even the most brutal incursions of the modern state. It’s a civilisation we really can recognise when we see it, taste it, touch it, even in these darkest hours. There can be no justification for the wanton destruction of ancient monuments. But let’s not confuse that with the living pulse of civilisation, which often resides in what at first glance seems small, domestic or mundane. There we will find it, beating patiently, waiting for the light.